As an alternative we offer the purified DNMT3B polyclonal antibody - Classic (C15410218). Polyclonal antibody raised in rabbit against mouse DNMT3B (DNA methyltransferase 3B), using a KLH-conjugated synthetic peptide containing a sequence from the N-terminal part of the protein. 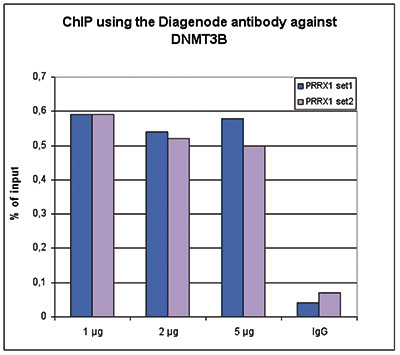 ChIP assays were performed using GDP control cells, the Diagenode antibody against DNMT3B (Cat. No. pAb-076-005) and optimized PCR primer sets for qPCR. ChIP was performed on sheared chromatin from 1 million cells using the “iDeal ChIP-seq” kit (Cat. No. AB-001-0024). A titration of the antibody consisting of 1, 2, and 5 μg per ChIP experiment was analysed. IgG (5 μg/IP) was used as negative IP control. QPCR was performed with two different primer pairs for the PRRX1 gene, used as a positive control target. Figure 1 shows the recovery, expressed as a % of input (the relative amount of immunoprecipitated DNA compared to input DNA after qPCR analysis). 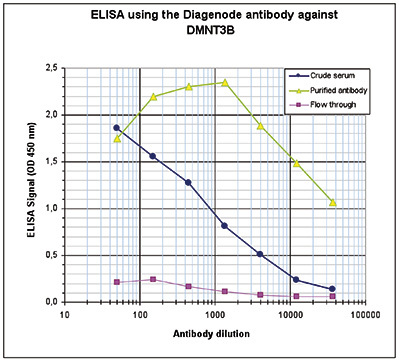 To determine the titer of the antibody, an ELISA was performed using a serial dilution of Diagenode antibody directed against mouse DNMT3B (Cat. No. pAb-076-005), crude serum and flow through in antigen coated wells. By plotting the absorbance against the antibody dilution (Figure 2), the titer of the antibody was estimated to be 1:32,400. DNMT3B (UniProtKB/Swiss-Prot entry Q9UBC3) catalyses the genome wide de novo methylation of CpG residues, which regulates gene expression. DNMT3B is essential for development. DNA methylation on CpG residues is coordinated with methylation of histones. Six different isoforms of DNMT3B, produced by alternative splicing, exist although isoforms 4 and 5 may not be functional due to the absence of two conserved methyltransferase motifs. Diagenode strongly recommends using this:	DNMT3B polyclonal antibody - Classic (Diagenode Cat# C15410076 Lot# A16-0042). Click here to copy to clipboard. MCPH1 maintains long-term epigenetic silencing of ANGPT2 in chronic lymphocytic leukemia. A key role for EZH2 in epigenetic silencing of HOX genes in mantle cell lymphoma. Add DNMT3B polyclonal antibody - Classic to my shopping cart.